This collection of emotionally uncensored autobiographical tales spirals back and forth through time describing the author’s struggles and emerging awareness. They reveal how she grew an unconditionally loving, fiercely protective inner caregiver who helped her to finally end the battering of her virulent inner critic (the Hatchet Lady). This fierce and tender inner caregiver brought simple lessons in radical self-care, self-compassion and self-love that have transformed Robyn's ways of being with her self and with life. 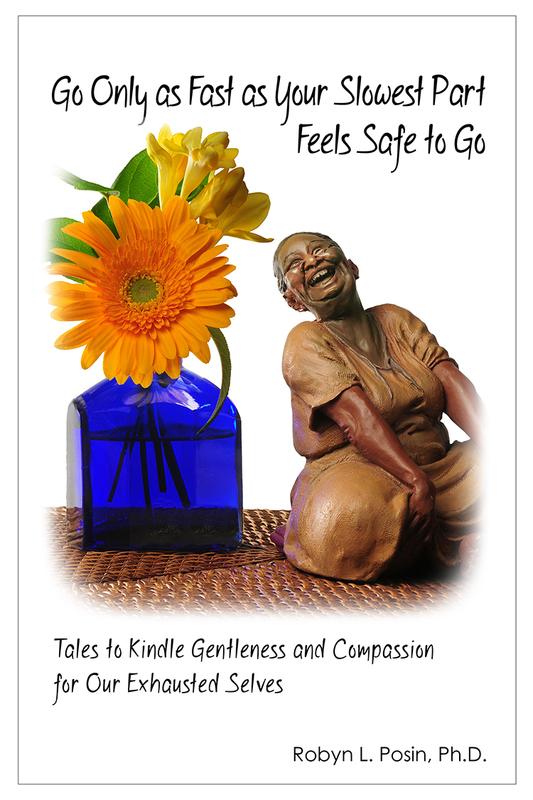 These lessons – affirmations and reminders of long forgotten or culturally suppressed truths about the importance of taking the very best care of our own vulnerable selves – are at the center of the tales in Go Only as Fast as Your Slowest Part Feels Safe to Go. They offer practical steps and encouragement for learning to be more gentle and compassionate with our over-stressed selves. Tenderly Embracing All the Ways That I Feel and Am: Journaling to Kindle Gentleness and Compassion for Our Precious Selves is designed as a companion to Go Only. A bound 8 1/2 X 11 journal, its otherwise blank pages are edged with words and images to inspire and invite you to write, draw, explore and reflect on your journey. Robyn, a psychologist in private practice in Ojai, California, has dedicated her life, work, art and writing to healing and helping others heal from the harshness that our crazy-making world visits upon all of us, particularly upon women. A former hyper-self-critical super-achiever, Robyn has gradually learned how to slow down, listen in and tenderly embrace all the ways she is and is not. Available at Amazon.com or as a Kindle or iBook.